The Bosch VideoJet X encoders belong to a family of industrial, high-performance, single, dual, or quad input CCTV video encoders. They are built into a rugged housing and constructed to withstand extreme environmental conditions. The VideoJet X encoders may be used at extreme temperatures, operating from -30 °C to + 60 °C (-22 °F to +140 °F). These powerful and flexible devices represent the cutting edge of high-performance video over IP for CCTV today. VideoJet X encoders are ideal for outdoor applications such as perimeter, border and fence control, as well as for industrial applications where they are tolerant of harsh environments. When used at remote locations you benefit from their wide 10 to 30 VDC power input range, so that they can be battery or solar powered. You also benefit from their SFP slot that allows a direct connection to a fibre interface module without the need for external fibre hardware. Their industrial-grade vibration resistance makes these encoders extremely suitable for use in mobile applications such as trains, buses or other vehicles. 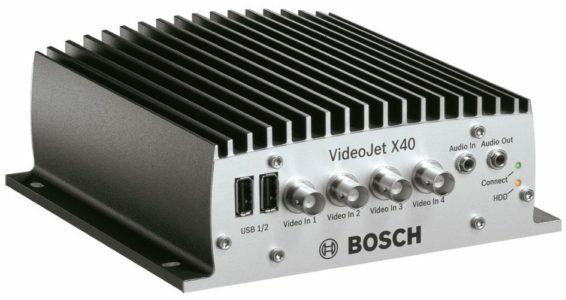 View the VideoJet X encoder video on a PC using a Web browser, VIDOS, in the Bosch Video Management System, or integrate it into another video management system. By routing the IP video to a high-performance VIP XD video decoder or a VIDOS Monitor Wall, you can present the video with ultimate clarity. The encoders feature a highly flexible recording scheduler, providing up to ten programmable recording profiles and allowing individually assigned camera profiles. With these profiles, you can accelerate the frame rate as well as increase the resolution on alarm, saving recording space during non-alarm periods.